When the AirPods were finally out in December 2016, I got my order in for the first batch. The cabled EarPods always fit my ears well, so they’ve got that going for them. 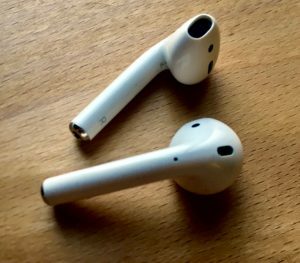 While they don’t cover all use cases, they worked well for me and so my expectation for the AirPods was to do pretty much the same, but without the cable mess. they are probably the most convenient and comfortable pair of earphones that I’ve ever owned. Seemingly endless battery life if you’re willing to give them a quick rest in their tiny charger box after several hours of listening. And I’ve had several occasions where I was walking around the house searching for them, just to realize that I was wearing them all along. they have one really big quirk that’s regularly driving me up the wall. I cannot elaborate too much about 1. – they simply match my currently most prominent personal use case really well, which is being around the house, working on books and stuff, producing podcasts and other things. Now that spring has sprung and I’ll be more out and about, that might change. During my last flight, I went back to my trusty Etymotics (modded with Shure foam plugs) as usual, because they don’t take up any serious space, don’t use battery and they cut out airplane noise really well. Let’s talk about item 2. Here’s the thing: a while ago Apple introduced one of the most overlooked but most wonderful featureswith the iPhone: instant Siri reaction times. No need to wait for the *bing* sound, no need to wait for Siri to realize that you’ve stopped talking. Siri will pretty much instantly react. Of course it will still send what you said to its servers that do voice recognition and so on, so there’s that waiting time, but all the other waiting time is gone. I use Siri this way all the time. It’s fast. It’s convenient. I don’t like waiting for computers, so this usage model is a wonderful fit for that. “Hey Siri” – too slow for me most of the time. And too unreliable. So I don’t really use it. Double-tap the AirPods. This will pause whatever you’re listening to right now, wait for a second, then go *bing* to signal that you can talk. Once you’re finished talking, it will wait for an eternity of one to two seconds to make sure you’re done. Only then will it do something. This is agonizingly slow. Press and hold the iPhone’s home button. Instead of reacting immediately they will still wait for a second before they give you the *bing* and let you talk. At least they stop right away once you let go of the button. How do you like your AirPods?